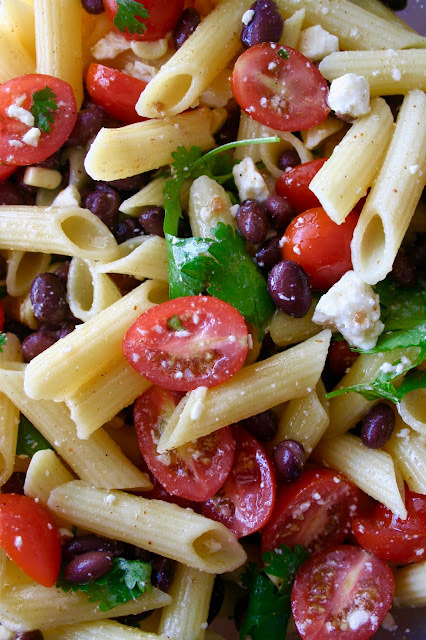 If you are looking for a perfect pasta salad for your next neighborhood barbecue, this is it. This pasta salad is so different than your standard every day mayo-based salad and so tasty. We actually ate this for dinner and it was completely filling. I don't know what it is about Southwest flavors, but they are just my kind of jam. I can't get enough. 2. For the pasta salad: Zest limes and place zest in a large salad bowl. Place cooled, cooked, drained pasta in a large salad bowl with lime zest. 3. Add beans, tomatoes, pepper, onions and corn. Toss with dressing. Season with salt and pepper, to taste. For best results, chill 1 hour before serving. Right before serving, sprinkle cheese on top.